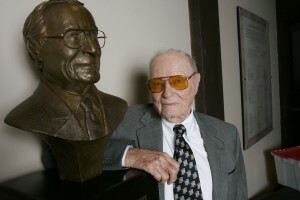 Craig Noel with a bust of himself at The Old Globe in 2006. The San Diego Theatre Critics Circle is proud to name its annual awards in honor of the late Craig Noel, who is universally acknowledged as the founding father of San Diego’s theater community. During his distinguished 70-plus-year career with The Old Globe, the much-honored director staged over 225 productions of all styles and periods. His achievements as a director, educator and visionary were recognized on Nov. 15, 2007, with the award of the 2007 National Medal of Arts at a ceremony in Washington, D.C.
Born in New Mexico in 1915, Noel came to San Diego as a child. He has been associated with The Old Globe since its community-theatre inception in 1937 and has guided the organization through its metamorphosis from a community theatre of the highest standards to one of the nation’s most successful not-for profit theatres. Noel’s most recent world-premiere productions include Lillian Garrett-Groag’s The White Rose and Reuben Gonzalez’s The Boiler Room. He also directed the American premiere’s of Alan Ayckbourn’s Mr. A’s Amazing Maze Plays and Intimate Exchanges. Other recent Noel directorial assignments include Wonderful Tennessee, Shirley Valentine, Travels with My Aunt, and Scotland Road. Noel made his Globe debut as an actor in 1937. Two years later he accepted his first directorial assignments, staging four of the season’s seven productions. Noel’s contributions to San Diego and to the nation are legion. He has enriched the quality of life in San Diego through visionary dreams that became reality. He has enriched the larger community through his support and encouragement of playwrights, actors and theatre artists and through the nurturing of an entire generation of citizens who have become today’s theatre-goers and arts supporters. Noel created an audience for new works through his early ’60s spring seasons at the La Jolla Museum of Contemporary Art, where he introduced the works of Beckett, Ionesco, Anouilh, Pirandello, Brecht, Behan, Giraudoux and Albee to San Diegans. Their response was so enthusiastic that Noel instituted seasons of such works at the Falstaff Tavern, which was later remodeled and renamed the Cassius Carter Centre Stage (1969). Among Noel’s other innovations are Globe Educational Tours and the Play Discovery Program, which began in 1974. In association with San Diego State University, Noel established the world-renowned Shakespeare Festival at the Globe in 1949. He guided the theatre’s transformation to professional status in 1959, establishing it as the oldest continuing, professional not-for-profit theatre in California. Soon after the original Old Globe was destroyed by arson in 1978, Noel conceived the idea for the building an outdoor festival theatre in the wooded canyon adjacent to the theatre complex. The original Festival Stage was destroyed by fire in 1984. It was rebuilt and named the Lowell Davies Festival Theatre in 1985. To fulfill his long-held dream of a theatre that would extend across the border to enrich artists and audiences of Southern California’s two neighboring cultures, Noel instituted the Globe’s bilingual theatre component, Teatro Meta, in 1983. Teatro Meta administers an award-winning, bilingual in-schools theatre program. Noel founded the California Theatre Council and a former vice president of the California Confederation of the Arts. His numerous honors encompass the inclusion by The San Diego Union-Tribune in a list of 25 persons who shaped the city’s history; the Governor’s Award for the Arts; University of Arizona Alumni Association’s Outstanding Citizen for his contribution to their fine arts department; San Diego State University’s Outstanding Alumnus; honorary Doctorate of Humane Letters, University of San Diego; San Diego’s Living Treasure Award; Conservator of American Arts Award from American Conservatory Theatre; the San Diego Press Club Headliner Award; the San Diego Gentleman of Distinction Award; and a combined tribute from the Public Arts Advisory Council and the San Diego County Board of Supervisors. In November 2007, Noel was awarded the prestigious 2007 National Medal of Arts by U.S. Pres. George Bush in a ceremony at the White House in Washington, D.C. The medal, chosen by the National Endowment for the Arts, is the highest honor given to artists and arts patrons by the U.S. government. Noel’s contributions to the Old Globe, his support of other San Diego theaters and his efforts to put San Diego theater on the national map led the San Diego Theatre Critics Circle in 2002 to rename their annual awards for theatrical excellence in his honor. Noel unofficially retired from day-to-day operations in the mid-2000s but continued to serve as an advisor to the Globe on programming issues, including the resurrection of the Summer Shakespeare Festival in 2004. After a prolonged illness, Noel passed away at his Mission Hills home on April 3, 2010. He was 94. 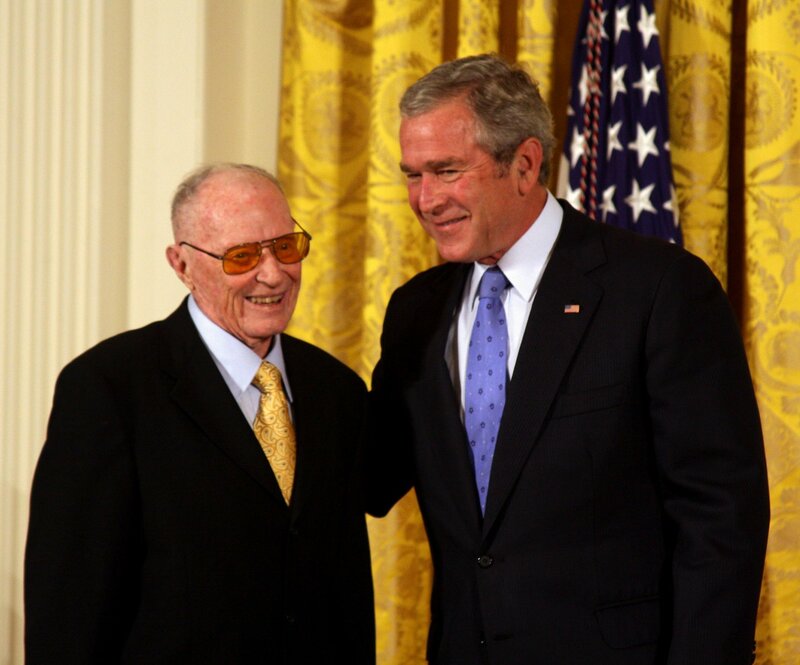 Craig Noel with President George W. Bush after receiving the National Medal of Arts in 2007.